Watch, interact, & work with us via livestream! Rachel Moore goes live at least a few times each week to share insights, predictions, and takeaways to help your business keep up with content trends. Really Social, as a top training and consulting resource, shares social media best practices via livestream. #LetsLivestream is the only Twitter chat + broadcast dedicated to the livestreaming landscape. Each week, Really Social provides a Twitter chat and live broadcast called #LetsLivestream. If you’ve wanted to not only learn more about livestreaming but also join a community of others who are trying things out, click below to join us. 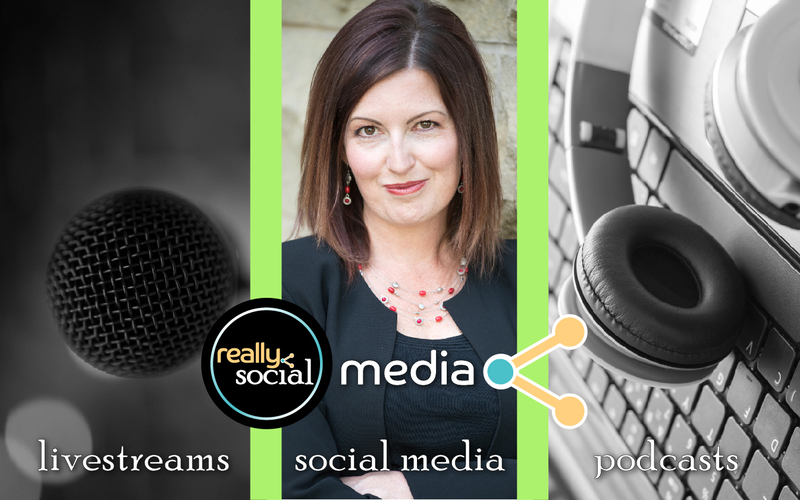 Business Unusual is the livestream + podcast show created by Rachel Moore and brought to you by Really Social, Inc.
Business Unusual is the weekly livestream show and podcast created by Really Social and hosted by Rachel Moore. You can watch the live interviews (and possibly influence the direction through your comments) before they hit the podcasts! Let me go live for you! Do you need a livestreamer for your campaign or event? Rachel Moore brings her style, her personality, and her broadcasting chops to work for your brand. With experience in Facebook Live, Periscope, Snapchat, and Instagram, Rachel can work within the platforms you use to connect with your audiences. If you seek additional production value, Rachel’s partnership with Vitmug, BeLive.TV, and other resources will ensure your livestream has the polish you desire. If you need to go live but don’t have the resources or the persona at the ready, Rachel is ready to livestream.